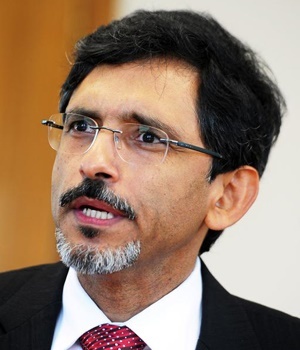 There is no reason for South Africa to buy trains from Asia or Europe, Economic Development Minister Ebrahim Patel told the South Africa Investment Conference on Friday. Patel said the country has the capacity to build its own trains and needs to "quite strongly" shift manufacturing from its current share of 12% of GDP closer to the Chinese level of 28%. The state's rail and port company Transnet has ordered hundreds of locomotives from China Rail (previously China South Rail and China North Rail), Bombardier of Canada and General Electric, which is American, but has long-standing investments in South Africa. The Chinese locomotive manufacturer is at the heart of allegations of corruption and price-gouging at Transnet. Production schedules for the delivery of trains are late. Transnet chairperson Popo Molefe, who this week fired CEO Siyabonga Gama, said that while Transnet had planned seven years of capital investment, it had dropped this to five years because of funding constraints. It is placing orders of R163.7bn into the market as it seeks to rejuvenate the rail network the company runs. Patel told the conference that South Africa was a hub for investment into the rest of Africa. "Africa is an opportunity. In 2009, intra-regional trade was only 12% of total, but that is now at 17.5%. Africa is the opportunity [because] of South Africa’s manufactured exports, 40% of it goes to the rest of Africa." South Africa wants to rekindle its train manufacturing capacity as part of a big investment in transport manufacturing. The poster-company of local transport manufacturing is Busmark, owned by Patuxolo Nodada. Nodada’s company is a partner in manufacturing the Gautrain, the province's popular light passenger rail service. He has built eight in 10 of the buses used on the country's various bus rapid transport systems. Nodada revealed that he will soon have a 96% local component Gautrain on the tracks - which would be the highest ever proportion of local materials. But he also complained that the Ekhurhuleni municipality had not paid him for a fleet of buses for its bus rapid transport system it ordered. As a result, he is now forced to export them. And from buses to T-shirts. Higher Education minister Naledi Pandor challenged all political parties to ensure that the millions of T-shirts they ordered for the May 2019 election be made in South Africa. Political T-shirts are extremely popular in South Africa, and are inevitably made in China. Pandor said she is challenging the textile industry to be ready to turn over orders of a million T-shirts a week.